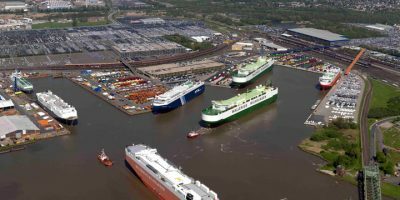 With a throughput of more than 2 million vehicles per annum, the ports of Bremen are firmly established as one of the largest automobile hubs in the world. To cope with these freight volumes, Bremerhaven has highly efficient facilities at Kaiserhäfen, Nordhafen and Osthafen as well as gigantic operating sites immediately beside these harbours: the total area of 2.4 million square metres can accommodate around 95,000 cars, including covered storage for 50,000. Bremerhaven is immensely important for the international automotive industry. Numerous specialists at the terminal attend to the transport and transhipment of the new vehicles and ensure the reliable supply of assemblies and components to the production plants. What’s more, our technical centres – the “biggest repair shop in Europe” – deal with more than 230,000 vehicles every year, handling inspections, retrofits and finishing. Bremerhaven is a major transhipment port. Although countless vehicles arrive here by sea and are transhipped to feeder vessels for onward transport, export plays by far the dominant role, accounting for a share of around 80 per cent. Particularly heavy vehicles such as rail freight wagons, special machinery or ro-ro trailers that are preloaded at the terminal are all handled in the “High & Heavy” sector. Bremerhaven is one of the largest automobile hubs anywhere in the world.